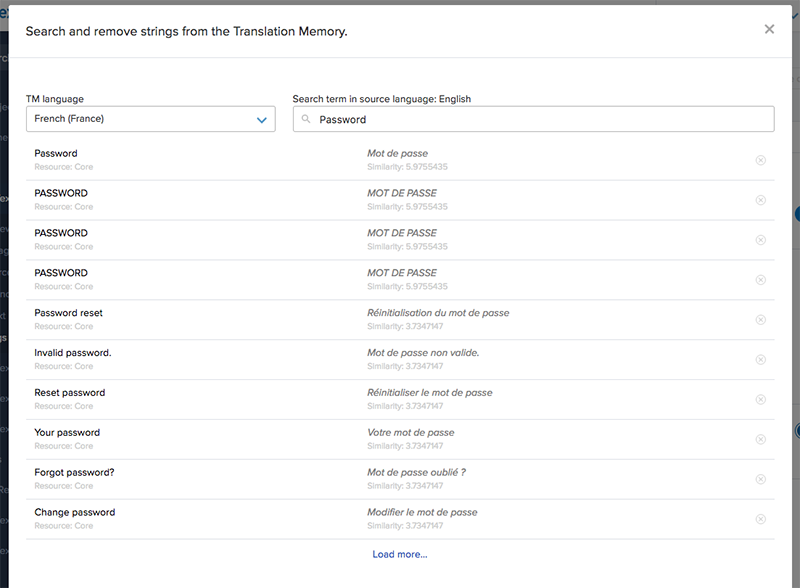 Deleting Translation Memory entries is a feature only available on the Growth plan and up. Only Admins and Project Maintainers can delete entries from TM. 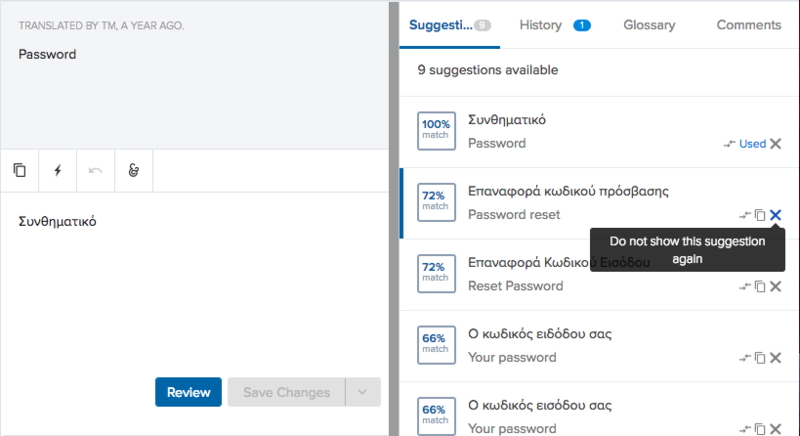 When you no longer want a translation to show up as a suggestion and be populated by TM when 100% similarity matches are detected — for example, when a word or phrase is poorly translated or your brand changes — you can remove it from your project's TM. There are a few ways to clean your Translation Memory. From inside the Editor, navigate to the TM suggestion you want to delete. Click the x next to the suggestion. In the popup, press Yes to confirm you want to delete the entry. Another way to delete a TM entry is from your project settings. There, you'll be able to search for a term in your source language and see every source string that contains that term along with the corresponding translation. From the Dashboard, click on the project that has the TM you want to clean up. In the submenu, click on General. In the Translation Memory Actions section, click the Search and remove strings from TM... link. In the popup, pick from the TM language dropdown the language of the TM entry you want to remove. If, for instance, there was a TM suggestion in French you'd like to delete, select French in the dropdown. Click the Remove icon next to the suggestion you want to remove. Click the Remove button to confirm that you want to delete the entry. In some cases, you might want to do a bulk cleanup of your Translation Memory instead of just removing a few suggestions. We allow you do this by overwriting your project TM with contents from a TMX file that you upload. Proceed with caution and back up your original TMX before importing a new one. Download the TMX file you want to clean up. If you only want to clean up the TM for one language, only download the TMX file for that language. Open up your TMX file in a text editor such as Atom or Sublime, then remove the unwanted translation entries from your TMX file. You can remove a translation entry for a single language by removing everything between <tuv...> and </tuv>. In the example below, the Portuguese (pt_PT) translation will be removed. Or you can remove entries for all languages by removing a whole <tu>...</tu> block. Save your TMX file when you’re finished editing it. We recommend saving a new version and backing up the original export somewhere safe. Head to the Settings page of the project you exported the TMX file from and in the General tab, click on the Import content from a TM... link. 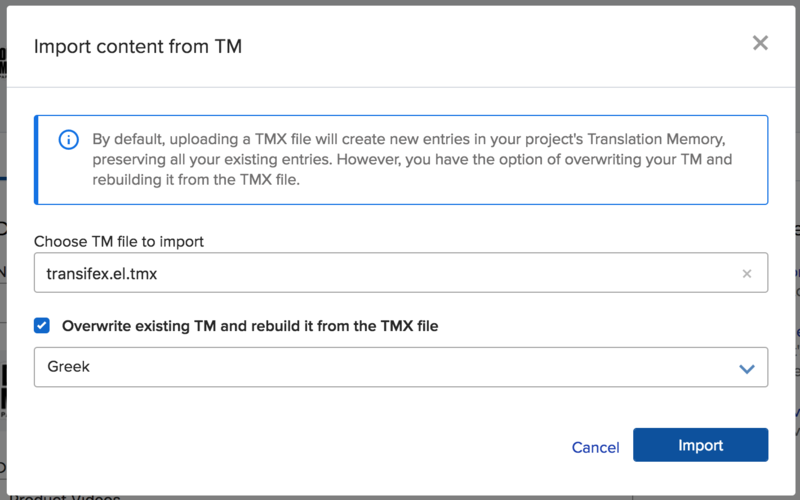 In the modal, select the TMX file you want to import, then check the box that says Overwrite existing TM and rebuild it from the TMX file. In the dropdown that appears, choose which language(s) in your TM you wish to overwrite from your TMX file. Click Import, then enter your password and click OVERWRITE TM to finish the import. Translations not in the TMX file are removed from your TM. They will no longer appear as suggestions or used for TM Autofill. Unchanged translations in the TMX file will remain in your TM. New/edited translations in the TMX file are added to your TM. Translations for other languages in your TM will remain unchanged if you choose to overwrite only a single language. When you remove suggestions from your TM, already translated strings will not be affected; they'll remain translated. In Transifex, each project has its own TM, so if your project is part of a Translation Memory group, removing TM entries from one project will not affect the TM entries of other projects belonging to the same group. The TM entry for "timeline" will no longer be available to the project A as a TM suggestion. The project A will still have the TM entry for "Glossary term" since this entry is also part of its TM instance.